Do you know how to check the value and quality of something you’re going to buy? The simplest way is to compare it with its opponents and available alternatives. In this article, we’re going to evaluate BigCommerce and its score among other ecommerce “players.” So, let’s start the party! BigCommerce is a website builder and one of the leading e-commerce solutions to run e-business today. According to statistics, currently, the number of live websites using BigCommerce reaches 62,502. This is the powerful, robust, with crucial functionality all-in-one shopping cart. 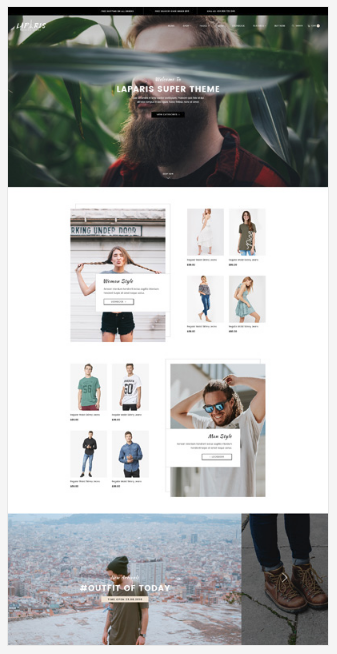 Everyone who uses BigCommerce can create a unique store’s design or choose the appropriate among its representative selection of responsive templates for the online storefront creation. There are also a set of effective built-in marketing tools to make your products popular and attractive for online shoppers. Even if your customers prefer physical shops, BigCommerce offers the service of shipping and delivery for the physical products. Another must-have from BigCommerce is its mobile-optimized storefront to satisfy the picky nowadays customers who are used to buy via mobile devices. 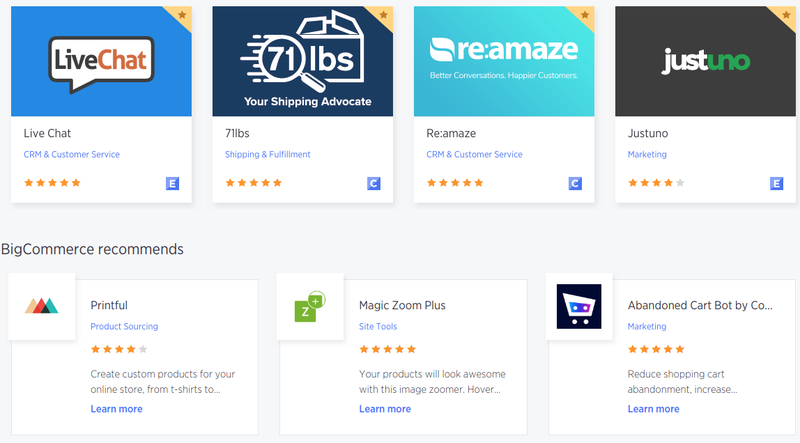 A comprehensive list of e-commerce features makes BigCommerce the fierce competitor comparing to other shopping carts. Scroll down to see what this e-solution can do to your e-shop! This is first and the principal feature when choosing the shopping cart for running the shop online. Starting from $29.95 per month this is ideal choice for eCommerce retailers that are just building or trying to grow in online trading. Why? Many of these e-traders don’t have and don’t ready to invest a lot of money into a website development process. BigCommerce took all wishes into account and offer reasonable pricing plans for its customers. Plus Free Demo! 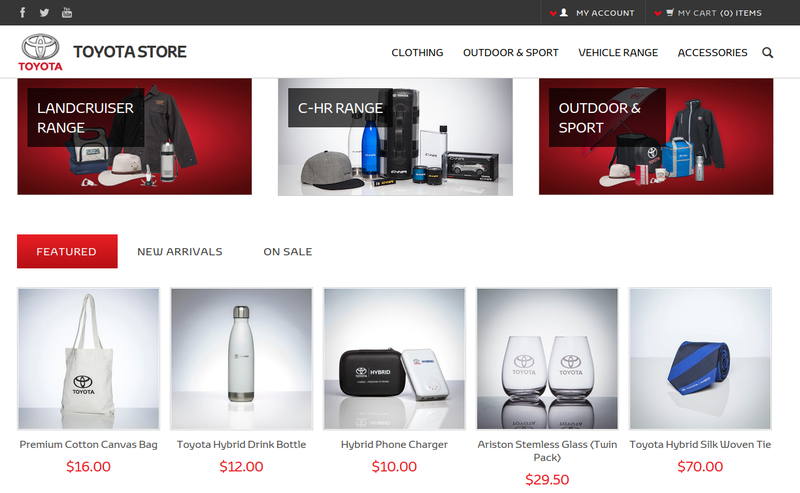 On-page customization is the area where BigCommerce is really good. If your must-have features list includes easiness of use, here you go. The platform is provided by user-friendly drag and drop builder, which make the work with e-store fairly easy even for complete e-commerce newcomers. For those, who never stop on the way to perfection...or higher income, there are plenty of extensions in the BigCommerce apps store. Choose the way in what to boost your business from powerful enterprise integrations and ecommerce apps. When it comes to creating beautiful, intuitive ecommerce websites to enhance the brand and engage shoppers, here BigCommerce templates work best. The company offers more than 80 responsive themes to drive your business sales. The collection of free and premium templates pretty fits all trading industries. The Big-Team guarantee: among the numerous templates available you’ll definitely find the one special. BigCommerce with BIG possibilities. The shopping cart’s developers have created the whole university for those who need some assistance in managing the e-store with BigCommerce. A set of free lessons on how to run the e-business, boost the online store’s work and grow your sales is what they offer to you. The series of video-guidances is made to walk the customers of all types through starting, managing, and developing a profitable online business. Create a website and forget or not have the possibility to make it mobile-friendly means deprive yourself of considerable number of customers. BigCommerce is entirely prepared to welcome the customers with mobile devices. All its templates work correctly on each type of device. You can check out from mobile the same way you would do on a computer. Аnd that’s one more reason why thousands of online merchants choose BigCommerce. Leading online retailers know how effectively Facebook selling works. It has over 1 billion active users every month and is the most effective playground to promote and sell your goods. BigCommerce integrates the e-stores with Facebook just in a few clicks. After this, you can easily sell through a great responsive Facebook e-shop. In addition, with the powerful advertising system, your sales will be more than just dynamic and numerous, they will be extremely massive. Yes, you can sell on Amazon directly from BigCommerce store and significantly simplify the work of your store. The shopping-cart’s industry-leading integration gives an opportunity to list the goods on Amazon directly from the BC control panel, with centralized inventory, order processing, and fulfillment. Benefit from available bulk listings, automatic inventory updates and ability to process the Amazon orders in BigCommerce. Gift certificates from BigCommerce are a built-in feature that allows your customers to get the electronic certificate for any specific range. When your customers buy a gift certificate, you’ll receive an email with order confirming and with the certificate details attached. Choosing a product is only half of making a purchase. Another part is the payment process. And the main shop owner’s responsibility is to simplify the payment way to make it as fast and effortless as it may be possible. BigCommerce customers may select from 40 payment gateways serving more than 100 countries and 250+ local payment methods. There no extra fees and the whole process is just a one-click setup. All payment solutions are mobile-optimized and support multicurrency from shoppers from all around the world. Building your store on BigCommerce allows you to substantially increase the visibility of your website on the main search engines. There are a lot of special tools to enlarge your website’s SEO score like integration with MailChimp, or iContact, or oLark, iDevAffiliate or other third party software items from API library. №12 All existing shipping providers. The platform supports all shipping providers. The most common of them are Australia Post, Canada Post, UPS, USPS or FedEx. Regular reporting allows you always to keep the store’s work under control. How often do you analyze your website work? In what way are you doing it? The built-in BigCommerce analytics is a valuable help for e-commerce store owners in managing performance indicators. BigCommerce Analytics is designed for merchants with quick and easy access and detailed reports that allow you to test different aspects of store’s performance. Who are BigCommerce clients? Bliss World, Skullcandy, Cargill, Toyota, Avery Dennison, Clarks, Native Union and many other. 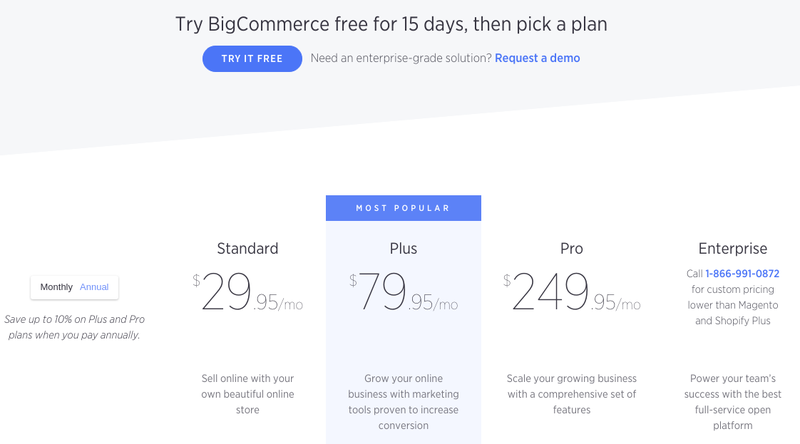 After our BigCommerce benefits list, the natural question would be: “What about drawbacks?” Yes, BigCommerce does has cons like limitations concerning annual online sales, price (there are many free shopping carts with similar functionality) or the built-in blog that requires improvement. But, comparing BigCommerce pros and cons, the first group is undisputed leader. From day to day BigCommerce import becomes more and more frequent phenomenon. Nowadays, the shopping cart is becoming very strong and powerful competitor for top-leading shopping carts. However, good player has dangerous opponents. 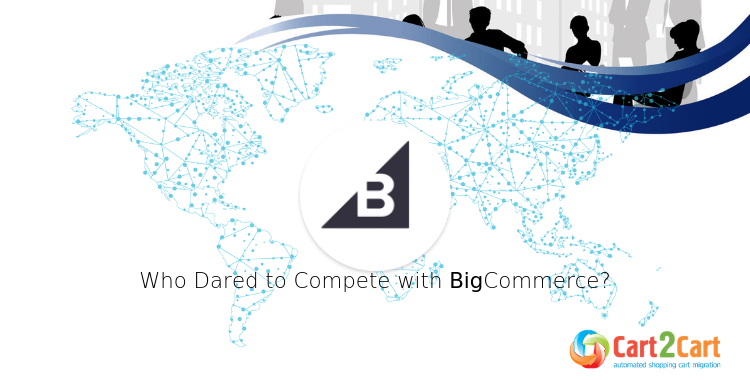 Ladies and gentlemen, we’re proud to announce the fiercest BigCommerce competitors. Shopify is the most popular hosted e-commerce solution among the 100 000 sites. This shopping cart is the best solution for those who want to postpone all technical things for later and concentrate only on the selling process. Shopify will significantly save your time, and this is one of the leading benefits of the platform. Shopify powers the most ambitious entrepreneurs all around the world, and the official numbers impress. Let’s check what makes Shopify stand out among other e-solutions. The Shopify Theme Store is a compilation of many free and premium ecommerce templates. 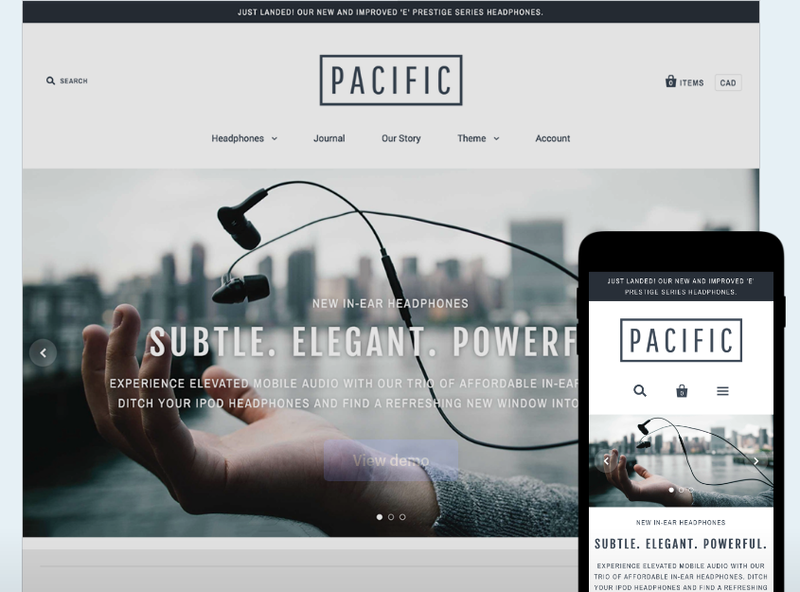 All themes are attractive, stylish and perfectly fit for any type of your business. The Shopify templates peculiarity is that the Theme Store has been created by world-famous designers - Pixel Union and Clean Themes. Built your marketing strategy easily. With Shopify, it’s like to drink a glass of water. Grab your customers attention via loyalty programs, social media, contest and many more. The rich diversity of marketing apps is ready to help you in “hunting” for the potential clients: MailChimp, Privi, Klaviyo, Better Coupon Box. Shopify has unlimited web-hosting included in all pricing plans. It consists of unlimited email forwarding, creation and registration separate domain name, using a content delivery network and immediate automatic updates. This e-commerce platform allows you to forget all worries concerning hackers, compliances, and other security-related issues. Shopify checks everything instead of you. It uses pay bounties for security researches. Shopify’s overall income depends on your sellings, so their developers pay great attention to software security and give substantial investments for it. Shopify has a dedicated support team that is available 24/7 and provides all kinds of support and assistance to its users: live chat, email, and phone. In addition, you can find the answers to questions on Shopify discussion forums, Help Center or even Ecommerce University. The shopping cart is extremely easy to use because it provides you with an already working online store structure. And instead of building the store from the very beginning, you have to create it from already existing parts. Speaking about this kind of Shopify advantage you have to be attentive in order not to turn the benefit into drawback. The thing is that not all Shopify themes are mobile responsive and you have to think twice before choosing design template for the e-store. However, due to the information from official website, all Shopify templates are mobile-friendly, so on any occasion, you may always contact the support team and ask for help. Shopify Apps store is a source of unlimited possibilities for e-commercials. With over 1200 apps in the Shopify App Store, you've got a lot of options when it comes to extending the functionality of your online store. 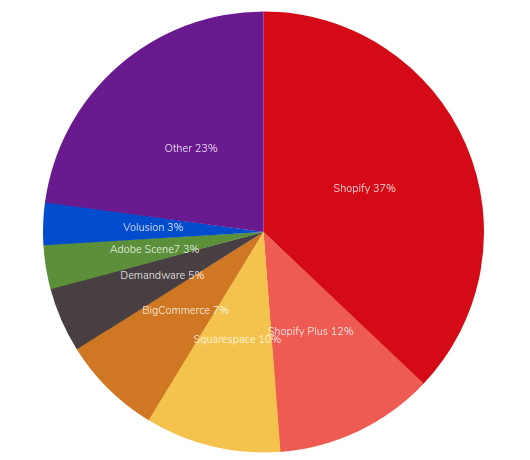 Who are Shopify Clients? BulletProof, Budweiser, WaterAid, The Economist, New York Times, Leesa Mattress, Sunday Somewhere, Penguin Books, Tesla Motors, FashionNova, Red Bull, Gymshark, Kylie Cosmetics. With the whole set of Shopify benefits the straight question here would be about disadvantages. Yes, nothing is ideal. But everything depends on you and your particular situation. Someone may be concerned due to Shopify pricing because sometimes it seems too high. Another one would claim about specialized language used on the platform. Yes or no - it’s only your choice. In any case, nowadays, migration to Shopify is extremely popular and winning solution which powers more than 1000 000 online shops from all around the world. PrestaShop is another well-known e-commerce solution for online retailers. The shopping cart is a powerful and innovative solution for those who are used to control all sides of the business and look for more progressive features to grow the e-shop’s sales and increase a total income. 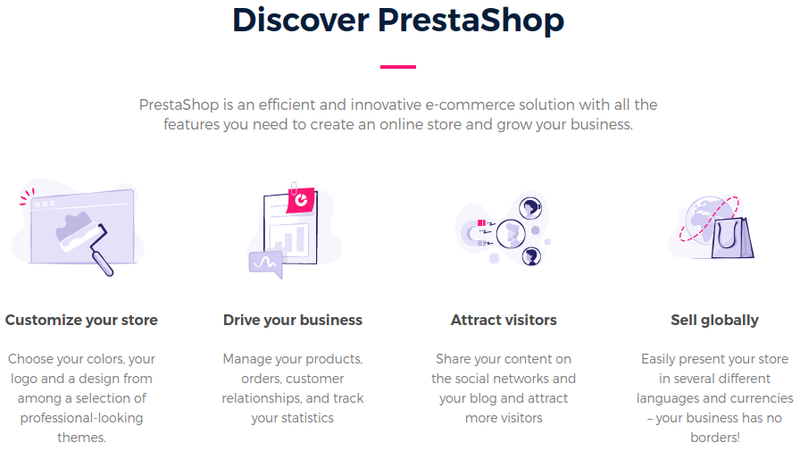 The company offers to join the community of PrestaShop clients and benefit from the various features that will help to effectively customize your store, drive e-business, attract new visitors and present your store in different languages and currencies. Let’s dive into more details concerning PrestaShop with the following list of characteristics. PrestaShop is a self-hosted e-commerce solution, and all its users have a full access to their e-store’s codes. If you are good in coding and development, this is a perfect match for you. Everyone with these skills can easily take advantage of diverse PrestaShop’s features and functionality because the source store’s code is available directly on the website. In case you’re not a programmer type, there’s no problem to find one who can do whatever you need. So, don’t worry about this matter, it’s a full package here. When we say that this shopping cart is easy to install and maintain, we mean it. The software is based on the “Smarty” template system that is straightforward in setting up. While PrestaShop installation you may need developer’s help, but only till it will be done. It is fairly easy to understand this cart’s functionality, so keeping control of your online business workflow will be like 1,2,3. As we said above, PrestaShop is the area where everything is under your control. This also refers to improving SEO scores of your Urls, Titles, and Descriptions. Just because these categories are very simple and easy to understand, it is not a big deal to achieve a high page and SEO ranks. Numerous PrestaShop in-built characteristics may conquer with the most powerful shopping carts functionality. Major PrestaShop functions are the best choice for beginners and medium online stores owners. Many items from the range of capabilities you can miss may be installed. As usual, they are free. Building the e-store with PrestaShop means getting user-friendly look up, more than 2000 mobile and responsive templates, 25000+ different plugins for expanding store’s functionality and many more. Creating effective promotional campaigns with PrestaShop is just a piece of cake. Select the one you like the most from the diverse promotional ways: wishlists, flash, and private sales, newsletters campaigns, loyalty programs, contests, etc. All the possible ways to help boost traffic and grow sales are here! PrestaShop developers have made a great work to make it easy for you to customize the store activities, while its performance. Here you can make customized invoices that match particular products. All store activities are automated, and that’s a significant help for store owners. Due to the intuitive PrestaShop interface, your store management is an straightforward task. If you feel that PrestaShop migration is your key to success, migrate with Cart2Cart and feel the difference right in a few hours. Who are PrestaShop Clients? MCdonalds, Maptiteculotte, Harryfay, Pop-line, NaturellEmentChanvre, Bolina Sail. Volusion is another one from the leaders among hosted ecommerce platforms. The team of creators focuses on creating full set of instruments for ecommerce owners wanting to build their e-store on the hosted shopping cart. Volusion creators have dwelled on operational features like inventory and customer management. But this has caused no harm to the other vital peculiarities. Before you migrate to Volusion, consider the following. The company offers Free Trial Version with the full set of features included. A perfect match for those who are still doubting between do I need it or not. You’re close to genius if you can easily start working on the new ecommerce platform and have nothing to ask and learn “how to.” That’s why Volusion has built-in on-boarding learning tutorials to help the users get to know What Where and How. Besides, this will require some extra costs, but, honestly speaking, this worth it. Volusion support team is available 24/7 via phone, chat, email and ticket system. Judging from the numerous customers’ review they provide an awesome and highly responsive service. Cannot to omit the Volusion’s team investment in international phone lines, knowledge base or chat software. The dedicated Support and Assistance team will treat customers with the highest quality and leave no question without an answer and no problem unresolved. Security is a fundamental item in running a reliable ecommerce store nowadays. The first argument is that you merely cannot make operations with credit cards when your website is insecure. Volusion offers its users to install the SSL certificate to protect their e-stores. The platform provides you with higher control over the security than many shopping cart platforms of the upper level like Shopify or BigCommerce. Everyone remembers this feeling when you log-in the e-shop at first and don’t know where everything is. Volusion is not an exception here, but there are an intuitive interface, strict navigation, and simple setup. The same story with Volusion’s recently updated backend design. Everything was done to make it easy to find what you need. In general, the user interface is easy enough with plenty of ecommerce options for both beginners and medium-sized users. Who are Volusion’s clients? Tiny House Coffee, Notch, Wooden Camera, Antonelli’s Cheese Shop, Lili Alessandra. Comparing with above-mentioned BigCommerce’s competitors - Shopify and PrestaShop, in our point of view, Volusion is slightly weaker. This is evidenced by a number of reasons. For example, the common issue that average customers face is pricing system and process. Mainly this is due to rapid transaction fees. Although Volusion does not charge the users a transaction fee, the company limit e-store owners with the bandwidth restrictions. The reason number two is again about money. Being a Volusion client, you have to pay for the SSL certificate which is your own. The price can variate from $90 to $1,000 per year. Basic certificate costs $89, and in case you need more powerful protection, it will cost you an arm and a leg. And the last but the most painful feature for those who know the value of blogging is the fact that there no blogging function. Ultimately, this is not the whole set of Volusion’s features. And the more detailed info on BigCommerce vs Volusion vs Shopify you may find in this article. Still, Volusion is a good choice for those who give preference to intuitive highly secured e-commerce platforms. If it’s you - Try free Demo and welcome to Volusion migration abilities. Choosing among the most spread BigCommerce alternatives be attentive. And think twice before changing the platform which is powerful enough to be among the leaders in ecommerce. Low prices have not to be your factor number one in choosing an eCommerce solution. It should be a small component and considered equally with mutually profitable features that can provide with benefits, you and your customers. Planning moving to another platform take into consideration a few features of the highest value. This includes 3rd party integrations and variable apps, qualitative 24/7 customer support available via phone, email or live chat and high amounts of bandwidth. All above-mentioned companies provide efficient services and have built a name for themselves in the world of ecommerce. Lastly, look carefully into your preferences and what components are important for you as for seller and your potential buyers as well. In any way, the best option here is to try the functionality in advance to be 100% sure your choice is right. Try Free Cart2Cart Demo Migration right now and be one step closer to the store of your dream!